It is natural that while playing the NHL 16 and waiting for NHL 17 to be released, game fans have some ideas how NHL 17 could be improved. So fans are sharing their thoughts on what is missing and could be added to the NHL 17 in various sites and forums. Here we collected some fans features wishlists that we thought are worth to look at. You can also write your ideas on how the NHL 17 could be improved in our comments section below. Third Jersey added. It would be great if a third Jersey would be added in Hockey Ultimate Team (HUT) and EA Sports Hockey League (EASHL). Added Jersey would renew the NHL 17 and will allow players to feel the real experience as the first thing that every player moves into before the start of any championship match is HUT. And EASHL is probably the favorite game mode is NHL series so the addition of third Jersey would definitely make it a lot better. Upgrading generic arena. EA team designed some really amazing distinct team arenas, like Detroit Red Wings – Joe Louis Arena, Minnesota Wild – Xcel Energy Center or Washington Capitals – Verizon Center. All of them have their unique ways of celebration and fun. But Regular Stadium is completely different – it lacks entertainment, attendees look boring, there is no cheering added. EA development team should definitely add more generic arenas to NHL 17. Adding goal song to HUT and EASHL. 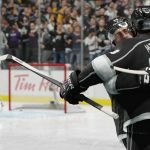 Goal song adds more enthusiasm to the game but it is missing from HUT and EASHL modes. So NHL 17 should have every goal celebrated in HUT and EASHL with team’s special goal song. Improved Announcer Performance. NHL has the best commentators like Eddie Olczyk, Doc Emrick and Ray Ferraro in the games. They put more enthusiasm to the game and delight the players with their awesome statements. But there are still some things that could be done in NHL 17. EA could add more new statements to commentators or even have new guest commentators for certain matches. Renewed Stanley Cup celebration. Stanley Cup is one of the best championships in NHL and its celebration has to be the grand event. So the Stanley Cup celebration should be put in the new level by having it luxurious way with pump up crowd and mascots. Introducing Custom League teams. NHL 17 could have an option to customize and create our own teams and take them to the battle in our own designed new league. There could be a vast of new abilities: from designing arena and celebration method to the completely full customization in order to enjoy the NHL 17 experience the fullest. Option of Custom-Made Jersey. As we all could agree, Jersey is a brand of every team. So why not give game players an opportunity to customize and style Jersey. That would create a deeper connection to the NHL 17 game. Modifying Goalie Masks. Imagine customizing goalie masks based on specific match, mood or arena. Such improvement would make NHL 17 game more evolving and fun. Providing the list of music to choose from. Music has quite an important part of the full gaming experience in NHL series. And we have to admit that the soundtrack of NHL games has been just awesome. But we all have different taste in music so EA can provide a list of music to choose from so that every player could make his own choice in NHL 17. Introducing new Leagues in NHL 17. Having new leagues in the game is always exciting so why not give NHL series game fans something to be happy about? EA team could add KHL, ECHL or some other leagues in NHL 17. Including National Teams. NHL 17 could have small national team match series where the winner will have an opportunity to play against champion team. By doing that national team will have an opportunity to pro itself and maybe have a chance to be added in the champions. That will surely bring more fun to the NHL 17. Have something to add? Share your thoughts and ideas in comments.